During the spring and summer months, beekeepers are often approached by members of the public who are concerned about bees on their property. 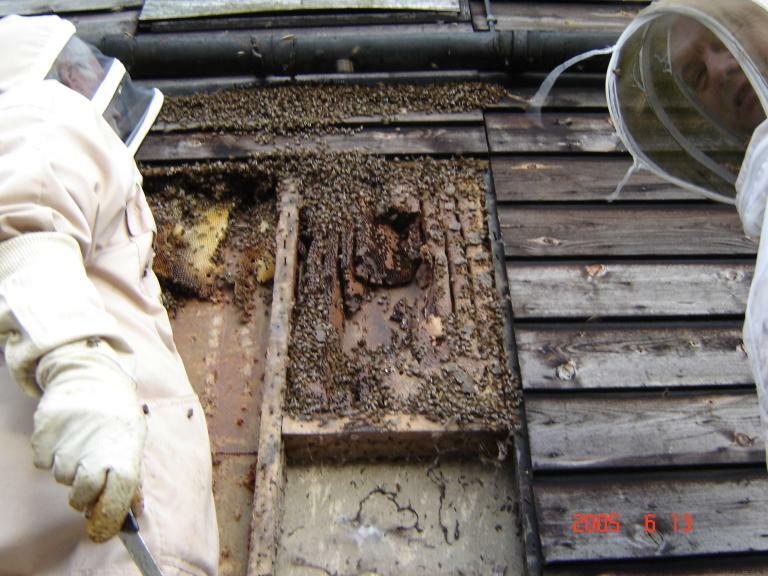 This page contains some advice if you have bees on your property and are unsure what to do. If you have honey bees then get in touch with us and we’ll see what we can do. If the bees are in a swarm then use the contact details on our swarms page as we’ll need to deal with it quickly before it departs. If you have an established colony of bees, then use the normal contact page. The success of moving a colony of bees depends on its location and the chances of locating or moving the queen. If the nest and colony can be accessed easily, then the chances of successfully moving the colony are increased. 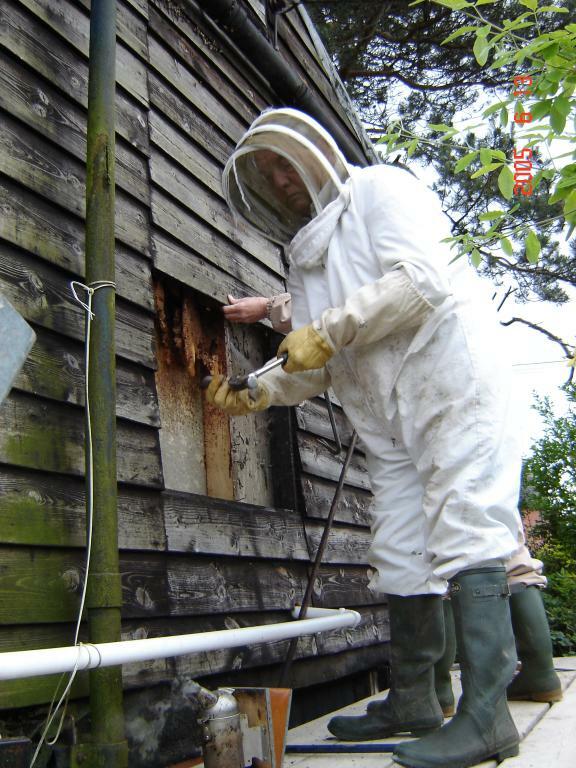 The photos to the right show some of our members removing a colony of bees from between the walls of a double-walled wooden building, with the permission of the owner obtained in order to remove panels from the building to get to the bees. If you have a bumble bee or tree bee nest then it’s unlikely we will be able to move it successfully. Unfortunately most bumble bee colonies are damaged by the movement process to the point where they cannot recover. Hence, we suggest that if you have a bumble bee colony you should leave it alone until the queen departs at the end of the season and then block off the entrance so that other bees and mammals cannot reuse the nest next year. Bumble bees are sufficiently gentle that they do not generally cause a problem if their nest site is treated with respect. Additional advice is available on the Bumblebee Conservation Trust website. 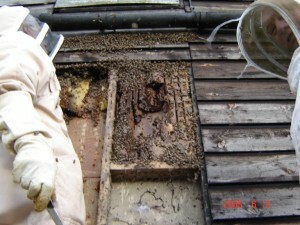 If you have other types of bees nesting on your property, then we are unable to help. For many kinds of bees, you can adopt the approach we recommend for bumble bees and leave them alone until they depart the nest, then block up any entrances so that the nest site is not reused. Since many solitary bees are very unlikely to sting, and are efficient pollinators, you may like to welcome them into your garden anyway especially if you grow flowering fruit and vegetables. For particularly destructive bees like carpenter bees, your local council will provide a pest management service. If you have a wasp nest then we are unable to help. You can leave the nest undisturbed until the end of the year when the queen wasp has left, and then destroy it. In the early parts of the year wasps will help manage the aphid population in your garden, which you may welcome if you grow plants that are susceptible to aphid attack. However, wasps can be quite aggressive, particularly in the late summer, and so you may want to remove them as soon as you can especially if you have young children. We would not advise removing an occupied wasp nest by yourself, so your local council will provide a pest management service that can destroy the colony and remove the nest.